The main goal of this post: Yes, you CAN lose the baby weight. And more importantly, you CAN keep it off. You CAN do it for less than $30. You CAN do this with a toddler in the house. I’m not a superwoman. I’m not an athlete. I’m not someone who can do 10 reps of 20 pound bicep curls. Heck, I can barely do 30 seconds of push-ups. I still eat waffles or oatmeal for breakfast almost every day. I did not purchase any special ingredients either: no coconut flour, chia seeds, raw goat milk or anything normally absent from a typical grocery store. Why I am writing this post: I get asked about how I lost the weight, etc. many times, so I thought I would post about it. I have many blog followers because they are trying to eat healthier just to be healthy or maintain their weight. The #1 hurdle is actually NOT losing the weight, but keeping it off. Kellogg’s and all those other brands will happily help sell you stuff to lose weight. However, studies show that only 20% of us maintain the weight loss. I created this post into two parts because I have had to go through two phases: Phase 1 is Losing Weight and Phase 2 is Maintaining Weight. Why are they different? Because when you have different goals, you set up different rules. No one can keep losing weight forever and shouldn’t. Here is my journey, tips and how-to’s. Anyone can promise to lose the weight – and I’ve seen many of my friends on various “diets” just to gain it back because the diets were not able to be sustained. I don’t believe it is the person’s fault. I have read so many books on healthy eating and exercise that I have lost count. Reading books really helped because it is very hard to NOT exercise when your books state all the benefits of exercise. I found it harder to eat cake, cookies, and fried potato chips when reading books about how unhealthy they are. So, if you need some extra motivation, merging your other hobbies with diet and exercise might help. It did for me. My current weight is 135 pounds and has stayed between 133-138 pounds for 3 years. I know I was at 200 pounds and that is a weight loss of 65 pounds, but technically half of that was baby weight. I don’t want anyone to think I’m skewing my results or playing the “she had a baby” game so of course I lost weight. Before giving birth, I was consistently around 150 pounds and 5’9″. The Basics of What I Used: **Update** Some of these videos are now FREE on YouTube in HD. Making out of pocket $0. September 2010: 200 pounds. The largest I have ever been. I gave birth to Juliana at the end of September. She weight 10 lbs. and 21.5″ long. I have no idea what size I am. December 2010: 168 pounds. For the past 4 weeks, I have been steady at 168 pounds. The first 20 pounds of course fell off easily because… well, I had baby! But starting December, I was consistently 168 pounds that whole month. Juliana started sleeping a little better through the night. January 2010: 168 pounds. Size 12-14. I open an account at LoseIt.com. It says I need to eat 1500 calories to lose 1 pound per week. January 1st seems a good time to start because it is the new year and also my baby girl is 3 months and starting to sleep better at night. I write a list of foods I can eat on the fridge that are really low in calories, so I can feel better about eating a lot of them: carrots, celery, lettuce, broth soups, cauliflower, tea and coffee. February 2010: 164 pounds. Size 12. Weight coming off really slowly. I exercise at night for two reasons: 1, I know the kids will be asleep for sure or the hubby will be home in order to take care of it while I exercise. I can’t count on them being asleep at 5:30-6am. The kids… not the hubby. #2, my most trying time to NOT eat is night time. I love dessert and just want to go crazy because the evening makes me hungry. After exercising, I’m too exhausted to do anything but read for an hour and go to sleep instead of pigging out. March 2010: 156 pounds. Finally! It took two months of exercise and eating right, but finally saw some progress and the weight fell off. Again, I used Loseit to track the calories and did my exercise routine in the evenings (routine is below). April 2010: 150 pounds. Size 10 or 12 (my old clothes). This was my weight before having kids actually and “my goal” weight in Lose It. I can fit back into my size 10/12 clothes again. May 2010: 143 pounds. Size 8. I stopped tracking my calories in LoseIt.com, but I have been so accustomed to eating a certain amount of calories that I just keep doing it without thinking. Still exercising 5 times per week, but not the same videos as before. June 2010: 135 pounds. Still not tracking calories, but continue to workout 5 times per week for 30-45 minutes depending on the workout. July 2010: 128 pounds. Well, this isn’t good. It’s too low. So, I eat a lot of nuts, beef and fuller fat dairy products in addition to what I normally eat to get my weight back up. August 2010: 135 pounds. Size 6. Pretty much stayed here the whole time. Continuing to exercise 5 times per week. Continuing to eat the same meals you see here on Whisk Together. July 2014: 135 pounds. I exercise 5 times per week for 30 minutes each or 4 times per week at 45 minutes each. At least, anywhere that has a basement or gym. I learned that once swimming pool season hits to start exercising in the morning. Why? Being out in the sun and playing with the kids drains my energy. I have little internal motivation to exercise after swimming all day. Figuring that playing in the pool was “exercise”, I quit for a few weeks. And what happened? I gained 5 pounds. So, I started back to exercise in the morning instead when I had the energy. Ate the same things though! 1. It was all calorie based. 3. If you have been to a Dave Ramsey/Financial Freedom class or read about budgeting your finances, you probably came across the envelope idea. Money goes into each envelope labeled $$ for groceries, entertainment, gas, etc. Same went for calories. Because just like calories, we have only a limited amount especially when trying to lose weight. And the minimum consumption of course is 1200 calories. Don’t go below 1200 calories! Then, the body thinks it is in famine and starts to put on weight instead of lose it. This is how I thought of it and planned out my meals. It is NOT as bad as it seems. Like most people, I eat the same things over and over for breakfast and lunch! So, I just ate those things and put them on rotation over and over into the LoseIt app to keep track of the calories. 300 Bonus Calories were for “dessert”, or snacks when I was really hungry, or just omit if I didn’t think I was hungry. Dessert is in quotes because much of what I ate for dessert was really breakfast. Like cocoa puffs in milk is only 200 calories and just seemed so tasty after a workout for some reason. Yes, it isn’t great for you – but it was only temporary and while trying to eat fewer calories. If you eat real food ALL day long, I don’t think a bowl of cocoa puffs once in a while could kill you. But, I’m sure there are websites to say I’m wrong. There’s a website for everything! When you have rules on your budget, you create freedom to do what you want with the rest. Similarly with calories, when I have 2000 calories per day to spend, I spend them according to my rules. 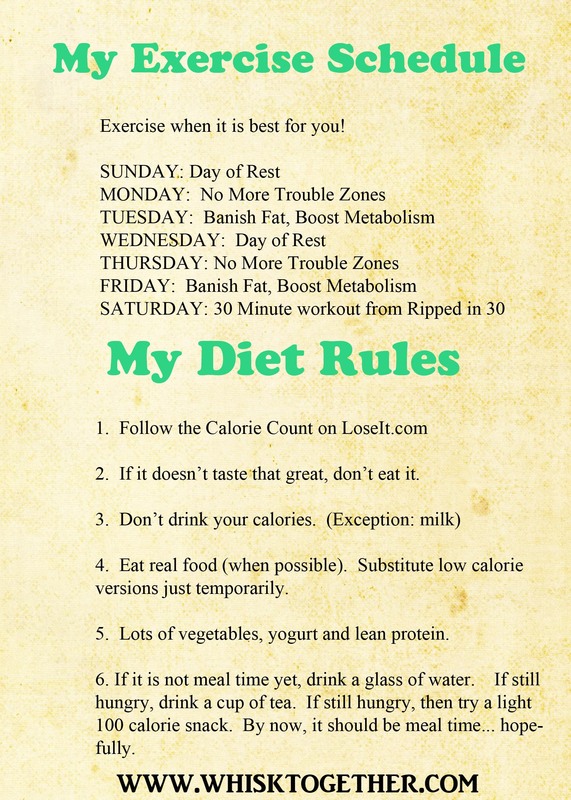 Dieting rules are listed below. 1. Real food if possible. Yes, Cool Whip has fewer calories. But, I don’t want to eat sugar, wax and condom lube. 2. If you really, really want it and can’t stop thinking about it, then eat it! Because you’ll probably eat 400 calories of other food trying to avoid the 300 calories of ice cream that you were trying to avoid anyway. Believe me… I’ve tried. 3. If the real food is REALLY high in calories, then maybe we can go with a lower calorie equivalent with not-so-terrible ingredients. Sometimes we use sugar free syrup from the store and sometimes the natural Joseph’s sugar free syrup. It is cheaper to buy Joseph’s online than at Whole Foods. Whole Foods charges $7 per bottle. 4. Yes, you CAN eat out. And, of course, I had rules for that, too! Panera/St. Louis Bread Co.: Pick 2 French Onion Soup 200 calories and tuna salad on wheat 260 calories or Broccoli Cheddar Soup 220 calories and many others! Most Other Places: Checked out ahead of time. Most places I could get a veggie and salmon or sirloin steak for around 500 calories. If the place had the word “fried” in the title… I probably couldn’t find much to eat there. Continue to Exercise and Eat Right and…. 1. Your blood pressure, heart rate and cholesterol levels will be awesome! 2. Your immune system will get a HUGE boost! 3. You can rock that dress without a care in the world. 4. Your optimism will soar! 5. You will be less likely to develop certain cancers. 1. You have to buy all new clothes, bras and underwear. This might actually be fun for some. I hate shopping for clothes, so it was more of an arduous task for me. 2. You have to eat less than you used to… ALL the time. When you lose weight, you need fewer calories to maintain that weight. Someone who weighs 200 pounds needs more calories than someone who weighs 160 pounds (given that their calorie expenditure is about the same and for most of us, we don’t change our calorie expenditure too much unless perhaps you change jobs or totally change your routine). 3. That flab that you thought might FINALLY go away? Nope, still there! I know there are people that exist that have had children and get their fabulous 6 pack tight abs back. Unfortunately, the truth is that it just isn’t possible (for me anyway). (Or maybe it is if I had a trainer and an MD supervising me… but that costs money.) My lowest weight was 128 pounds, and I still have the flabby stomach and the inner thighs that don’t see the light of day. So, don’t be disappointed if it doesn’t happen. My collection of videos. Yes, there are 13 of them… but I’ve collected them over 3 years and spent less than $130. That’s about 2 months of a gym membership at the YMCA. There are other videos with Jillian out there, but I didn’t like them for various reasons. FREE Videos: Some of these video are FREE to Amazon Prime Members as well! Some people don’t like what she says… just mute her! The girls are doing the moves for you right there. A few of the videos, and their levels, are free on Youtube as well. The computer, especially a laptop, can be hooked up to a bigger TV with an HDMI cable or regular cable depending on how new the TV and laptop are. And they are in HD!!!! WOW!! –No More Trouble Zones: 45 minutes of strength training. Good beginner modifications. Still one of my favorites. Really listen to when she tells you to breathe. My workouts were better after I knew to exhale on crunches and inhale on the way down. –Banish Fat Boost Metabolism: 45 minutes of cardio. Requires NO weights. So, you need one video and 6 feet of space. If I haven’t kept up with this workout, my hamstrings will sometimes be sore the next day. –30 Day Shred: 3 workouts that are 30 minutes each. Beginner workout starting out. So hard at first, but after 30 days you really do see a difference. –Kickbox Fast Fix: 3 workouts that are 20 minutes each. GREAT for when you really don’t have a lot of time. Or, combine 2 of them for a fun 40 minute workout. Beginner workouts where you can go as hard and fast for more advanced workout. –Extreme Shed and Shred: First workout is 30 minutes. Second workout is 45 minutes. Even though she says in the video and on the cover that it is 2 – 30 minute workouts. It isn’t. The first one is fairly easy. The second one is intermediate. Doing them together nearly wore me out. It’s really hard to do them together, but a great way to do a full 1 hour and 15 minute workout if trying to lose weight and you have the time. –One Week Shred: 2 workouts that are 30 minutes each. One is labeled strength and the other cardio. These workouts are created to be done in the same day – in the morning and night. Preferably, I’d rather do cardio in the morning and not at night. But anyway, they are definitely intermediate to advanced moves depending on who you pick to follow. As usual, there is a beginner modification. I think I used it on some moves. It really works you hard. –Killer Buns and Thighs: 3 workouts that are about 35 minutes long. Beginner level. This one is fun and brings back the 30 Day Shred girls that we all know and love. –Yoga Inferno: 2 workouts that are 30 minutes long. Level 1 is relatively easy. Level 2 is moderate. I start at level 2 each time because I found level 1 not challenging. This is a Yoga hybrid. There are yoga moves and there are high intensity intervals mixed in as well. –Yoga Meltdown: Probably my least favorite of the videos… Some of the moves I am still working on doing like knee on elbow. –Killer Abs: 3 Workouts for 30 minutes each. Great ab workout. Sometimes I think that level 2 is harder than level 3. This happens quite a bit to me in several videos. Love the moves, the results, everything. Definitely a beginner video. –Ripped in 30: 4 workout levels at 30 minutes each. If I had to pick just ONE video to take with me to a desert island, this video is IT. First, there are four whole workouts! That’s like $2/workout! Level 3 actually feels harder than level 4. Why? I think it is the jumping lunges in level 3. This is difficult towards the end of a workout which she includes in circuit 3 out of 3. Jillian Michaels works everything in this video from abs to arms to glutes. –Hard Body: 2 – 45 minute workouts. Level 1 was not so bad. Level 2 is exhausting. I do likes this video a lot because of the variety of moves. I know some people don’t like the DJ in the video, but I find it amusing. –6 Weeks 6 Pack: 2 – 35 minute workouts. Level 1 is beginner. Level 2 is intermediate. If I find myself doing a lot of elliptical and cardio in a week, I will throw this video in for sure. It seems like if the abs are not worked consistently, then they tend to go first. Great fast paced workout that really gets you sweating. Thanks for sharing your story. I need to lose weight but I don’t want to follow a fad diet. It just doesn’t make any sense to me. I need to learn how to eat in a way that will work with my life for the rest of my life. My thoughts exactly! Humans have thrived all over the globe eating what was available. Why can’t we? Check out the freezer meal section on the top of the page as well! Lots of make ahead meals, worksheets, etc. Question do you have the serving size and calories with your recipes? Usually I do not unless the original recipe has already provided it and I use the exact same ingredients as the original. What a great post. Thanks for sharing and you look great! Awww, thank you! And thanks so much for visiting!! I stopped breastfeeding before I started exercising and dieting. Kelly Mom – a great breastfeeding resource – has more details here: http://kellymom.com/nutrition/mothers-diet/mom-weightloss/. But, from my research on calorie intake, you could diet while breastfeeding. The calories would just need to be adjusted. For example, if you need a daily intake of 1900 calories to maintain your weight and you decide to diet and consume only 1400 calories. Then, while breastfeeding, you need to increase the calorie amount to about 1600-1900 calories. LoseIt and other programs calculate your “maintain weight” calories based on height and activity level. Maintenance levels would definitely be higher breastfeeding. I am a nursing mom who has slowly been losing weight via weight watchers the past few months. I would advise to wait for 2 months (or maybe longer if you are having supply issues). Kelly Mom does have great advice. From my research exercise doesn’t hurt your supply but too low of calories can. Thank you for visiting! I agree – too few calories can hurt you breastfeeding or not breastfeeding. Were you nursing your baby when you were eating healthier? If so, how did you take that into consideration? I don’t want to not eat enough calories so my baby isn’t getting the nutrition she needs. Any suggestions? I stopped breastfeeding before I started exercising and dieting. It is possible though to diet and breastfeed! Kelly Mom – a great breastfeeding resource – has more details here: http://kellymom.com/nutrition/mothers-diet/mom-weightloss/. From my research on calorie intake, you could diet while breastfeeding. The calories would just need to be adjusted. For example, if you need a daily intake of 1900 calories to maintain your weight and you decide to diet and consume only 1400 calories. Then, while breastfeeding, you need to increase the calorie amount to about 1600-1900 calories. LoseIt and other programs calculate your “maintain weight” calories based on height and activity level. Maintenance levels would definitely be higher breastfeeding. Thank you. This was helpful and informative! Hi, I stumbled on your post via Facebook and am very inspired. i could be you – well,the you from four years ago. I am just at 170 pounds and definitely need to lose some weight as well as get healthier. I have been half-heartedly making an attempt to do so but with four young kids, I get discouraged easily. Thank you for writing out what you did and how you did it. I feel like if you can do it, so can I. I checked my Amazon Prime account and several of the Jillian Michaels videos you mentioned are available for me to use free through my membership. Score! It’s meant to be. Thank you again so much. That’s awesome you have a prime account! And to do this with four kids would be a challenge, but I know you can do it. It has been easier to exercise as the kids get older because they can keep themselves entertained for 30 minutes. Changing my routine has also helped as they get older. 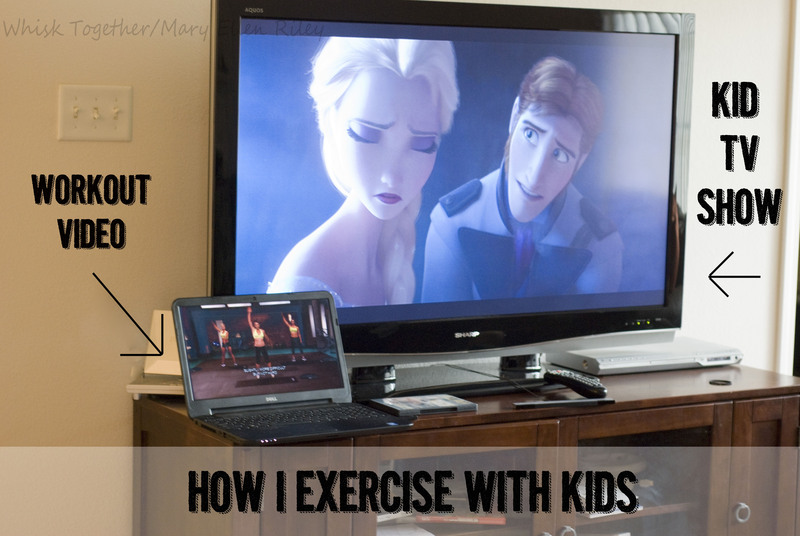 Between ages 1 and 2, the little one would nap in the afternoon and I would exercise. After age 2, she could start watching TV shows, and I would have the video on my laptop while she watched an episode of Doc McStuffins. Imagine four kids seeing your work hard and reach your goals! They will be so proud! Thank you so much for this. Your rules are a lot like mine. I have lost a similar amount of weight and similar range: 205 to 130 over about 2 years. I fluxuate between 130-135. Maintaining is hard and confusing. I weigh myself twice a week: mondays and thursdays. Monday is almost always higher, because i’m less strict with myself on the weekends. I pretty much make choices based on the scale: if my number was low-indulge, if high-restrict. Not a great plan I suppose. It’s easier to lose weight because there is a goal. Maintaining has no goal other than don’t gain too much. I struggle with guilt over overindulging and occational binges. I’m frustrated by the flab. I figured I’d lose weight and have tight skin-nope! It’s disappointing. Thank you for being so real and thank you for the practical advice. I really like the comparison to the envelope system. I may adopt a similar plan. Thank you so much for replying with your similar story. And 205 to 130 is Amazing!! I weigh myself on Sunday mornings. But you are right – the new study that came out last month said people generally weigh the most Monday morning and the least Friday. I have binged as well and really, really surprised at how little I do gain. Once I think I ate 3 or 4 cinnamon caramel rolls. It’s weird, but when they are homemade I don’t notice a weight difference. But store bought stuff I do. When I do workout videos I do Jillian Michaels and many of them are absolutely free on YouTube. You can find tons of awesome workouts by all kinds of different people for free on YouTube. And good job for sticking with it and getting healthier!! I need to do better at sticking with the exercise. My immune system could definitely use a boost. The immune boost is quite fascinating. In what I read, just exercising once even gives your system a boost. So for those that don’t exercise on a regular basis, they would benefit from a quick workout before a plane ride. Thank you for the tip about the BeFit channel I always felt guilty using bootlegged footage on YouTube. What a great resource, and a great post! P.S. Found you via MoneySavingMom! Thank you so much for this post! I’m a huge Jillian Michaels DVD fan and I’ve been curious about her new “one week shred.” If you get bored with these, Bob harper has a 4 pack of DVD workouts at Target for $15. They’re all about 60 min and give you a Great workout! “One Week Shred” was good for something different. 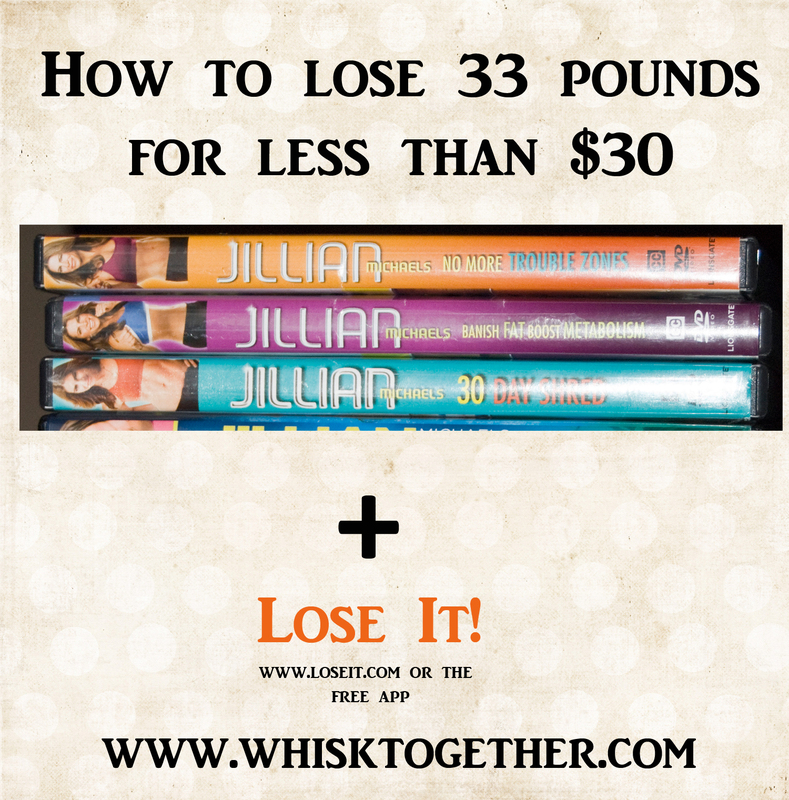 But, I later realized it isn’t as cost effective as videos like “Ripped in 30” that give you four workouts. Thank you for visiting!! Hi Kristy! Thanks for visiting! The $30 was for the 3 workout videos that I used. Each of Jillian’s video cost around $8-9 each currently via Amazon. Back in 2011 when I started my goal, Youtube didn’t have the entire workout available and Amazon Prime didn’t have free stuff available like they do today. So technically, it could $0 now! I do like having the videos though just in case our internet were to go down. Thanks for sharing this. I can relate because our weights are so similar. After having my second child, the weight came off all on it’s own. I did not work out, I didn’t diet, and just breastfed and the weight came off. I got a lot of compliments and just gave breastfeeding all the credit. I fluctuated between 129-135 for a couple of years after that… until I became pregnant with my third child. The weight came back on and I didn’t really care. I knew this was my last pregnancy and I was confident I could breastfeed the weight off again, but no. I am still have about 28 lbs I am carrying and my son will be 1 next month. Breastfeeding didn’t do it this time. 🙁 I did work out a few times, but then got “too busy.” I really need to make exercise a priority. There were a couple of periods that I got “too busy” like during the holidays. But, later regretted it and never stopped exercising since. The delayed onset muscle soreness hurts too much. Thank you for visiting the website! After my first child, I don’t remember doing anything special and the weight came off much easier as well. All I cared about was getting back into my old clothes. 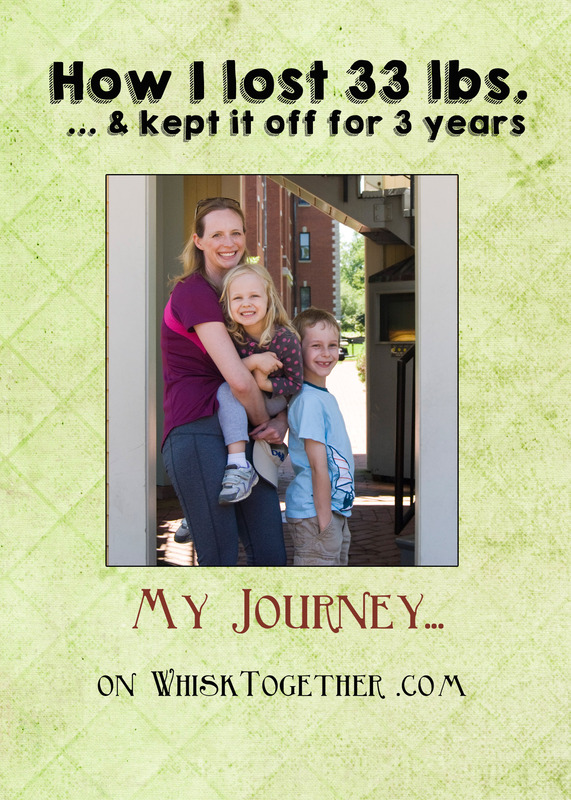 My goal changed and I wanted to be healthier, so I started this journey after my second child. Priorities are key! You are so right! I really needed to hear your story. This is how I lost weight in the past, but after 6 kids and in my 40’s, my weight does not want to budge. I have been dabbling with another ‘healthy/weight loss’ plan, but some of the restrictions have been hard. I have been so discouraged because it seems like everyone is losing weight on this plan and enjoying the foods (I have had enough of coconut oil…ha), but I am just getting discouraged. I have been stuck at 142 lbs for months with no movement. Your way makes sense to me and seems more realistic. Thank you for this post! Thank you for article. I am now in my mid 40’s and it is harder to lose. I know I need to make some changes and your article will be a great motivational tool. We did join our local community center mainly because my 17 year old daughter also needs to lose weight and get healthy. She would not exercise with me at home but is now going to Zumba and yoga with me at the center. Having her with me is also great motivation! Thanks for your blog. Will read them more frequently now! That is awesome that you found a routine and a method that works for you. Everyone needs to find what works for THEM. And even that can change when your routine or needs change! I like to exercise at home, but I know a lot of my friends will only go to the gym. I was always able to lose my weight after babies by breastfeeding! And playing with my children keeps me strong. Even now, as a grandma I can toss my grandchildren in the air and wrestle with them. But just recently, my weight has started going up again. Sometimes thyroid is to blame, but I know I am not as active as I need to be. Maybe I will find some exercises in the free youtube videos that will inspire me! I’m glad you found a legal channel! It’s hard to find them sometimes. Way to combine concepts from losing weight and saving money (i.e., envelopes). 😉 But I so appreciate that this approach doesn’t require a big financial investment, or adopting a weird fad diet. I’m trying really hard not to name any right now. 😀 Thank you for this encouragement. We can do it! Hi! Even though you say you aren’t counting calories now, would guesstimate you are eating around 2000 a day now, or do you still try and stick to around 1500? Hi Angela! I eat around 2,000 calories per day now. I am 5’9″ and after checking Lose It, Calorie Calc (http://www.calculator.net/calorie-calculator.html) and another one – they all stated I needed about 2000-2100 calories. After 3-4 months of looking up the calories and recording everything I ate, it really helped me gauge what the right amount was and how much I was really eating. For example, my husband didn’t understand why he was trying to eat less and not losing weight. After I told him to try Lose It again, he realized that all those pistachios he was eating “just a little of” turned into an extra 500 calories per day. Thank you so much for posting the links to the YouTube videos. I have been checking out copies of these from the library so often, I’m sure they wish I would just buy them. Now I can leave them for others to discover and watch online instead. Thanks! Hi Becky! Thanks for visiting! Great idea about the library! Thanks for that posting. It was just what I needed. I have a quick question. What did you enter into lose it for your exercising? Just so I get the right calorie count. I have the 30 day shred and Ripped in 30 videos. For most of the videos, I put it under “aerobics” and chose “high intensity.” Then, you put in your minutes of course. That category seemed to be pretty close out of all of them to the workout involved. Quick question… I used my fitnesspal last summer and lost 17lbs… And then gained back about 7 of it this past winter. I’m back calorie counting (it’s the only thing that works for me that I can a stick with) and I’m trying to decide if I should be eating back my calories I burned during my workouts or not. Did you add more calories into your day for working out or did you just leave them and use that as a way to lose weight a little faster? Some days I feel like I’m need them, while other days I’m fine without eating them and feel completely full. I’m trying to lose ~2 lbs a week and hoping to lose a total of 25 by mid-fall. Thanks for this great post!! P.S. I saw your a fellow St. Louis girl! My husband and I lived in the suburbs for 3 years before moving back across the river!!! Hi Kaitlin and thanks for visiting! I totally agree with the calories and workouts. I just approved another comment on it. Lose It and FitnessPal (I’ve heard great things on both) do give you extra calories when working out for the obvious reasons. Sometimes I used them… and sometimes I didn’t. It depended on how hungry I was. Sometimes workouts really drain me and I don’t feel like eating at ALL. Sounds weird, but it’s true. Sometimes, I have tried drinking like 40 ounces of water and still feel really hungry and I would eat the calories. I did read that exercise does great in maintaining your weight as well. Exercising 5 times per week – regardless of what I ate – seemed to always keep the pounds stable. I stopped for 2 weeks because of various stuff, didn’t change what I ate, and like gained 5 pounds in a week! Ketogenic is what I am doing and i’ve lost 11lbs in 4 weeks!! Thank you so much for sharing your journey. As a new mother to a two month old, and three other little ones (ages 5,6, & 7), I have the desire to reach my weight loss goal. But it is difficult with my husband being away so much with his job in the military & me being home alone with the kids. Your experience gave me hope that it can be done & I’m not alone in my fears. Thank you for being so brutally honest too! I had to smile when you said things like the first 20 lbs were easy to lose because it was all baby weight and the left-over flab can be so discouraging. These 2 things have been so true for me. I’ve currently lost 26 lbs just from breastfeeding, alone, and my baby is nearing 3 months. But after 4 children, I see the evidence of carrying them on my body every day when I look in the mirror. I don’t want to dwell on this part of my journey, but I fear my own obsessive qualities with this imperfection. Do you find you wear clothes differently or shop for different types of clothes (looser, less form-fitting, not as confining jeans, etc.) For example, after losing the 26 lbs and getting many compliments on my goals thus far, I was feeling confident to wear a dress to a wedding I was attending in June, but after trying it on & seeing my mid-section, I returned the dress & wore pants and a flowy top instead. I like to dress with the trends, but I don’t want to be unrealistic. What are your thoughts or personal experiences with this matter? Again, thank you! Ok this may seem like a silly question but when your allotted calories are say 1500 and you exercise, do you still stick with the 1500 calories? I got the Lose It app and when I put in my exercise, I get more calories to burn. I just want to make sure that I’m doing that right. your example for calories for the day was at 1500 but doing those workouts everyday would give you more calories–right? Yes! Workouts give you extra calories in your plan! 1500 calories and the “envelope system” is similar to the cash envelope system: Everyone will have a different amount of money to work with because we all have different incomes. Similarly, your calories will be different from mine (unless you are also 5’9″) and yes, Lose It does give you more calories when you exercise. More exercise = more calories. You can eat those calories, or if you aren’t hungry don’t use them. It depended on how hungry I felt. Mary, I love your story! Have you ever tried Plexus Slim? No, I have never purchased any systems, special foods, diet plans, etc. I do have a question for you. You said at the beginning of your post to not go below 1200 calories (which I completely understand). On the Lose It app if I log in my exercise it will subtract those burned calories from my total to give me a “net” amount. Should I make sure the actual food calories stay above 1200 or the net amount? What did you do? of all friends about this paragraph, while I am also zealous of getting experience. Love this–so motivating! Since writing this, have you added any new workouts or videos to your routine? Any new tips? Thank you! Great question! I have started doing almost all my workouts off of fitnessblender.com. They have a great variety of different workouts, lengths and levels. I like the Tabata style ones they have, too! After adding up the amount of money that a few more dumb bells would cost, I purchased Power Block from Amazon. It ranges from 3 lbs. to 24 lb weights all in one which would have cost me over $200 easy! are a large number of SAP jobs waiting for you out there. Also what are the meals you rotate for breakfast and lunch? Breakfast and lunch I used foods from Trader Joe’s and Costco quite a bit…. They were in bulk, made without preservatives and junk, quick and cheap. Breakfast: 1 egg, 1 toast and a coffee. This was 200 calories and sometimes I would add a little jam to my toast. A bowl of oatmeal was 150 calories and I would add 100 calories to it in the form or blueberries or banana. Lunch: Frozen chicken nuggets (well, because this is what the kids would eat as well) were 240 calories. Or a Chick Fila grilled chicken sandwich, fruit cup and diet lemonade. Or Panera Broccoli soup with 1/2 tuna sandwich was 400 calories. Eating out actually made lunch easier because the restaurants have already portioned out the food for you. Whole grain bread like Healthy Life and deli meat. Then add various fruits and veggies to everything. You mentioned you read books about being healthy. I was wondering if you have a kist of books you read. I have posted them throughout my blog, but that will take forever to read through 🙂 The books I liked were by author Michael Pollen and I liked reading “Sugar Fat Salt”. Marion Nestle’s “What to Eat”. Many times I would read a book and then it would refer me to another book or have referenced it in the works cited. I love everything you have said here! It has motivated me to stay on track. I’m currently 160. I just got down to preprego weight and I want to go to 145/140. When I was reading this on my phone, I thought there was a link to sample menu or recipes of what you were eating. But now I can’t find it. Maybe I misread it on my phone. Do you have a sample diary? I’m always looking for more ideas! Thanks! Oh, now I see that you were saying you were still eating recipes from your blog. And a link to your website was provided. Sorry to post again, but I wanted to say Nice Job and a great blog as well! Yes. I tried to keep it vague with calorie counts because so many people have so many tastes and I was hoping they could use it as a guide to eating in, or eating out, or eating meals from their local grocery store. Thanks! I’m cooking the Fajita Frittata now! Great job keeping it off! 30 day Shred is my go to. After so many viewings, I don’t want to hear Jillian anymore, so I mute the TV and turn up some good workout music. I find it way more motivating than cheesy music and hearing about how awesome Natalie’s form is for the millionth time. Hi, just stumbled upon this on Pinterest. Great post. Love your post and all of your tips on losing and maintaining weight. Do you have any tips to tightened the lose skin after weight loss? My skin tightened back up mostly everywhere but where I had my kids. Lots of water on the inside and hydrating lotion on the outside. Exercise also helps, too. Most of losing weight is diet, but exercise tones the muscles underneath which makes the skin sag less. Good luck! I do all of these things and can NOT get below 150 (also 5’9″). the one time I got down to 145, I was eating out super clean and working out like it was my job. Not the way I want to live, really. So frustrating! Hmmm, my only other suggestion would be to see an endocrinologist if that is possible. Your PCP may have to recommend them depending on your insurance plan. The endo can test your thyroid to make sure it is all normal. A little hypothyroidism could make weight loss come to a halt despite doing everything right. I had mine tested and I was at a 4.75 and should be below a 4. (Some PCP’s will say below 5, but endocrinologist will say 4. (Weird, I know.) A few micrograms of medicine later, everything started working right. These are songs I used to sing with the children of my Sunday college class. Another nice choice is to pair a pink shirt with a navy blue tie, as a result of they’re contrasting colours. white collar, and a slightly darker shade of orange tie for a daring, yet understated look. I need to lose weight but am absolutely not wanting to diet, I hate dieting but I am now 48 and I look like I am pregnant, I have lots of belly fat. Any tips to motivate me. Rebekah will be 5 next month and I still have all of my baby fat. This is an AMAZING post that speaks to me. I have aibrary of videos I haven’t used. I know it comes down to calories ( backed up by my dr). You have inspired me! !